I’m a big fan of skewers on the grill. Or kabobs if you prefer to call them that. They are (in my mind) perfect for entertaining. You can put together a head of time and then throw them on the grill once your guest arrive. I’ve found that when I entertain with skewers my guest think its something fancy–I guess skewers could be fancy? I’ve made these Asian Beef Skewers a few times now both for my husband and I and while entertaining. Each time, I’ve found that we have none left. Back in January, we had our good friends over for dinner. We typically go out to eat with them every other week. But this time I suggested everyone come over for dinner and I would cook. I made my Baked Vegetarian Southwestern Egg Rolls with Avocado Buttermilk Sauce to start with. While everyone was eating I prepped all the veggies and meat. Then I put all of our friends to work. We had a “skewer” party. Some made it a race and others were oh-so gentle with every piece of vegetable and meat. I’m one of them that made it a race–I wanted to get on with the “par-tay”. I made these Asian Beef Skewers, a grilled chicken skewer and my shrimp boil kabobs. We had so many skewers on the grill that we had to cook in two batches. Mind you we probably had 40 skewers for like 6 people. I recognize I tend to go a bit over board when making skewers, because I want to ensure that everyone has enough food. All of our friends (including us) were fighting over the Asian Beef Skewers. I love adding ingredients to skewers that are not the norm, like these snap peas! Who would have ever thought to grill snap peas? They actually grill beautifully and of course take the skewers up a notch. I like to use the Gourmet Garden herb paste. They keep well in the refrigerator and pack a big punch of flavor! I also have found that the skewers are much more appealing to the eye with a few sesame seeds sprinkled on top. 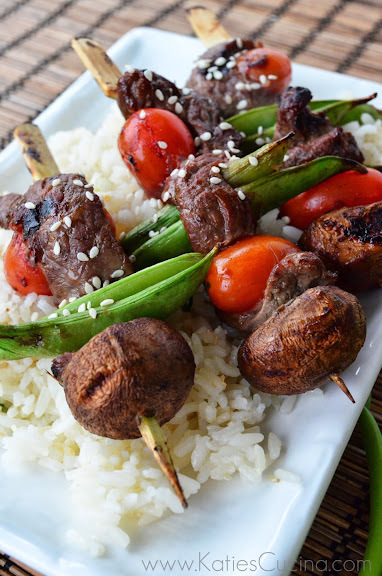 So if you want to make kabobs… give my recipe for Asian Beef Skewers a try! In a bowl, mix together hoison sauce, soy sauce, ginger paste, lemon grass paste, garlic paste, and sesame oil. Once well incorporated add the half pound of London broil pieces to the bowl. Mix well and let the meat marinate in the refrigerator for 30 minutes. *Soak skewers in water while the meat marinates in the sauce. Preheat grill to medium heat. Remove skewers from water, and remove the meat from the refrigerator. Rinse and prep all the vegetables. Begin skewering meat and veggies on to skewers, alternating as you'd like. Place skewers on grill for 10 minutes, turning once. *Ensure the meat is cooked to your desire then plate on a bed of rice. Sprinkle with sesame seeds. Don’t forget to enter the Flavors of Summer Giveaway. I’m seriously kicking myself for not having bought any kind of steak at the store this past shopping trip. These look so great! Hope you get to make these soon! They are so good! Thanks Kathleen! They are so good and easy to make! These look like manly-man skewers which would go over well at my house. ha ha Cathy and an easy way to sneak in a few veggies–I feel like non-veggies eats are more apt to trying it when its grilled and skewered! I’ve never put snap peas on skewers before. Brilliant! Can’t wait to try that. They’re like my favorite vegetable right now. I haven’t tried grilling snap peas, but now I will! I made a similar discovery about grilled celery. Suzanne–that sounds awesome.. grilled celery? I must try stat! You are brilliant. I just love these asian skewers. 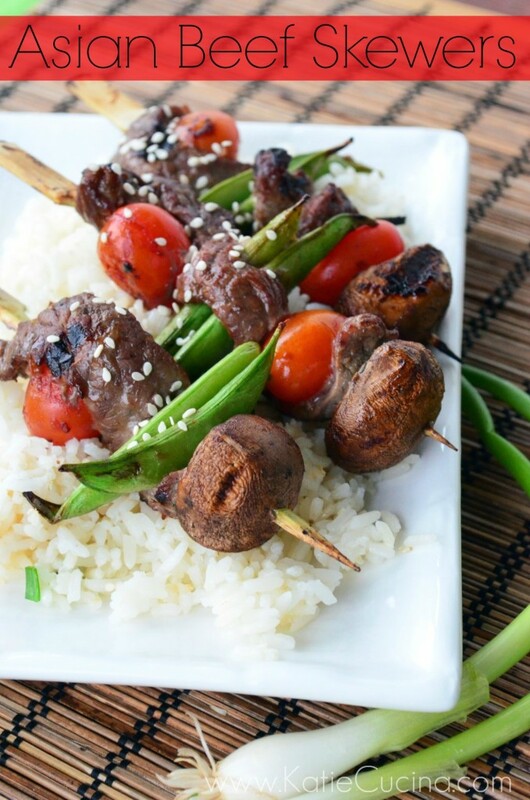 Kim–Asian skewers are the best! I love skewers too! I love the variety of skewers that you can make for one dinner! Love these Asian skewers! I love skewers, especially these 🙂 perfect combination!